From startups to established companies, business credit cards can provide many benefits to any company, from building business credit to normalizing your company’s cash flow and earning rewards. Business credit cards offer companies the flexibility to pay for purchases without the hassle of writing checks or having funds immediately on hand. 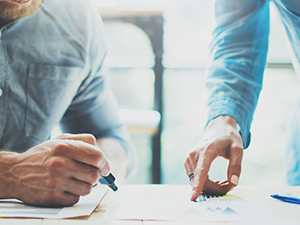 The benefit to establishing credit for your business is to create a credit history, which assists you if you need to apply for financing in the future. A credit card for your business can be an easier way to make payments, build business credit and even offer rewards. So, what do you want most from your credit card? Reward points? Cash back? An extended introductory offer? Well you are in luck! 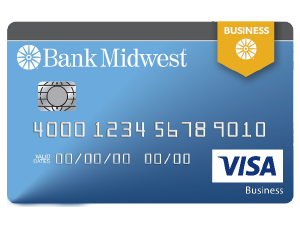 Now you have the choice with Bank Midwest’s VISA and American Express credit card solutions. Apply for a card at a banking center today! 1Bonus rewards points or cash back will be applied 6 to 8 weeks after first purchase and are not awarded for balance transfers or cash advances. One-time bonus rewards will be awarded after eligible net purchases totaling $2,000 or more are made to your account within three months from account opening. 2Reward points can be redeemed as a cash deposit to a checking or savings account with this Financial Institution or as a statement credit to your credit card account within one to two billing cycles. 3Cash Rewards Card: “Cash Back Rewards” are the rewards you earn under the program. Cash Back Rewards are tracked as points and each point in Cash Back Rewards earned is equal to $0.01. You may simply see “Cash Back” in marketing material when referring to the rewards you earn. You will earn 1 Reward Point (“Point”) for each dollar of eligible Net Purchases charged to your Account during each billing cycle. You will also earn 2 additional Points (for a total of 3 Points) for each dollar of Net Purchases charged to your Account during each billing cycle at merchant locations that are classified in the merchant category code as office supplies or cellular phone, landline, internet and cable TV services. In addition, you will earn 1 additional Point (for a total of 2 Points) for each dollar of Net Purchases charged to your Account during each billing cycle at merchant locations that are classified in any of the following merchant category codes: automated fuel dispensers and service stations or restaurants. The number of additional Points earned on office supply store purchases, cellular phone, landline, internet and cable TV services, automated fuel dispensers, and service stations or restaurants is unlimited. Points expire five years from the end of the quarter in which they are earned. 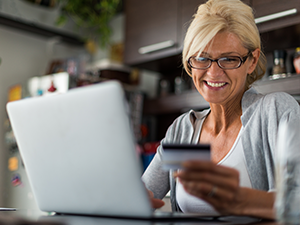 Click here to log in to your Bank Midwest credit card account.